For most photographers' kits, a 24-70mm zoom is a must-have. This versatile zoom range is an all-in-one solution for a wide variety of subjects, from landscapes and travel shots to portraiture and pretty much anything in between. Add in a constant f/2.8 aperture, like on the Panasonic 12-35mm f/2.8 II here, and you have an even more well-rounded lens that's good for low-light as well as better subject isolation than slower zooms. As for the Panasonic 12-35mm f/2.8 II, in particular, this "Mark II" lens is a refresh of Panasonic's earlier 12-35mm (24-70mm-eq.) high-end X-series zoom. Announced at CES 2017, the 12-35mm f/2.8 II is a relatively minor refresh of the previous 12-35mm lens, offering and updated exterior design -- a sleek black finish and updated lettering -- as well as Dual I.S/Dual I.S. 2 image stabilization compatibility on supported Lumix cameras. The AF system is also upgraded with new linear motors that support Panasonic cameras with 240fps AF drive sensors, and the lens uses a newer aperture control mechanism that allows for smoother, more even aperture changes while panning or zooming during brightness changes. The Panasonic 12-35mm f/2.8 II is a highly versatile lens for Panasonic shooters, for both photographers and videographers alike, and Micro Four Thirds users deserve to consider this model if they need a high-end 24-70mm -eq. f/2.8 lens. With top-notch performance, excellent image quality and excellent build quality, the Panasonic 12-35mm f/2.8 II earned the top prize for Best Standard Zoom of 2017 in our annual Lens of the Year awards. Read on below for our detailed lab analysis of this excellent standard zoom lens. Overall, sharpness is excellent with the 12-35mm f/2.8 II lens, at both 12mm and 35mm, and even at f/2.8. Compared to the earlier version of the lens, there isn't much difference in sharpness performance -- not that there was much room for improvement anyway. The old and new versions offer tack-sharp performance at most aperture settings. At f/2.8, we see excellent sharp centers, with ever-so-slightly softer corner regions. Corner sharpness improves slightly if you stop down to f/4-5.6. The lens remains very sharp throughout most of its aperture range, with diffraction-related softness starting to appear to a minor degree around f/16 and more strongly at f/22. Like the earlier version, the 12-35mm II offers excellent control against chromatic aberrations. As before, we measured slightly stronger CA at the wider end of the lens, but it's still very minimal CA, averaging well under three-hundredths of a percent of frame height through the lens' aperture range. As you zoom to longer focal lengths, the measurable CA drops significantly, with 35mm displaying extremely little CA. Again, given the optical similarities between the old and new version of the 12-35mm, it's no surprise that geometric distortion is nearly identical. As a wide-angle lens at the short end, the 12-35mm exhibits some minor barrel distortion at 12mm. And it is indeed minor, at well under 0.5% on average. Zooming out towards the middle-range focal lengths, distortion becomes practically imperceptible, while at the long end, there's a bit of mild pincushion distortion out in the corners. Vignetting is also similar, showing some noticeable corner shading at the wider apertures. At 12mm f/2.8, we measured the strongest amount of vignetting, between 0.5 and 0.75 stops of shading. Wide open at 35mm also displays similar, if not slightly less vignetting, at just over 0.5EVs of falloff. The other focal lengths also exhibit some degree of vignetting when shot at f/2.8, while all focal lengths display reduced vignetting as you stop down. Regardless of focal length, after stopping down past f/5.6 or so, vignetting is at its minimal (around or slightly under 0.25EVs of corner shading), but never entirely disappears. 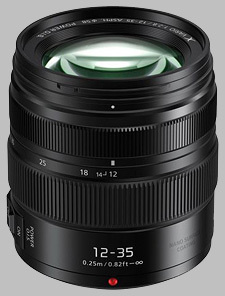 The Panasonic 12-35mm f/2.8 II uses an internal-focusing design much like the original version, but also now utilizes linear motors to help with speed and accuracy as well as keep focusing nearly silent. Panasonic states that AF tracking performance has been improved as well. In our testing, AF performance was very fast and very quiet. Nice! The lens uses an electrical focus-by-wire system, so the focusing ring on the lens will rotate freely while in AF mode. Full-time manual focus is available, though you'll need to control that setting via the camera body itself, as there is no AF/MF switch on the lens. This lens isn't specifically designed for macro photography, and only provides average macro capabilities -- just 0.17x magnification (0.34x / 1:2.9 35mm eq. ), with a minimum close-focusing distance of just under 10 inches (25cm). In terms of design, handling and build quality, the new 12-35mm f/2.8 II is very similar to its predecessor. The exterior finish and the styling of the letters and marking are updated, but the overall shape, size and weight remain unchanged. Physical dimensions are the same at just under three inches long and 2.6 inches in diameter (73.8mm x 67.6mm), and the weight is the same as well, at 0.67 pounds (305g). The Mark II keeps the same 58mm filter thread size as well, and also features the same circular 7-bladed aperture diaphragm. Optically, the layout is identical, with 14 total elements situated into nine groups. The lens includes one UED (Ultra Extra-Low Dispersion), one UHR (Ultra High Refractive), and four aspherical elements. It also uses Nano Surface Coating to help prevent ghosting and flair. Build quality is, as expected, really superb. The barrel is constructed from metal for durability and also includes extensive weather-sealing, including a gasket around the lens mount. The lens is compact and lightweight yet still solid-feeling. Despite the bright, constant f/2.8 aperture, the 12-35mm f/2.8 II remains characteristically small, which is one of the primary benefits to the Micro Four Thirds system. The lens features a focusing ring and a zoom ring. The zoom ring is the larger of the two (just under an inch wide) and uses a rubbery with raised ridges for a secure grip. The lens doesn't have any issue with zoom creep, and the zoom rotational action is very smooth with just the right level of firmness. The focus ring is smaller and composed of plastic with raised ribs. The focus ring will turn forever in either direction, with no hard stops to indicate a focus limit, even in manual focus mode. The lens ships with a small petal-shaped, bayonet-mount lens hood. The hood is about 1.5 inches in length and can be reversed onto the front of the lens for storage. Perhaps the most obvious alternative to the 12-35mm f/2.8 II is the original version of the zoom. However, as the Version 2 is its direct replacement, the older model is not likely being made by Panasonic any longer, and is no longer available for purchase as new from retailers such as B&H or Adorama. For new, currently manufactured alternatives, the closest option would be over in the Olympus camp, the 12-40mm f/2.8 Pro. Offering a bit more telephoto reach than the Panasonic option, with a 24-80mm-eq zoom range, the Olympus nevertheless still gives you excellent image quality and a constant f/2.8 aperture. However, the Olympus lens doesn't offer optical image stabilization, and unless you have one of the few more recent Panasonic bodies that offer IBIS, you won't have any image stabilization features if you opt for the Olympus lens. Now, if you don't mind losing the constant f/2.8 aperture and want to stick with Panasonic lenses for your Panasonic camera body, the Panasonic 12-60mm f/2.8-4 Leica is a great option. Offering a 24-120mm-eq focal length range, the 12-60mm is inherently more versatile as an all-on-one lens solution; and you get an f/2.8 lens at the wide-end of the zoom range, which is nice. The lens offers fast, linear-motor-powered AF, built-in image stabilization, weather-sealing, and it's $100 less expensive than the 12-35mm f/2.8 II. It's a great all-around lens if you don't need a constant f/2.8 aperture. We've yet to test this lens in our lab, but customer ratings are so far very positive, praising its image quality, versatility and build quality. Lastly, if you're really budget-conscious or just want an incredibly small zoom lens that has a similar focal length range, it's definitely worth considering the pancake-esque, retractable Panasonic 12-32mm f/3.5-5.6 lens. Despite often being sold as a kit lens, the 12-32mm lens is very sharp throughout its zoom range, and even when used wide-open. Vignetting is a little stronger at 12mm, but overall it's very good optically. Obviously, the biggest downside compared to the 12-35mm II is the aperture range, which is variable and much slower on the 12-32mm at f/3.5-5.6. This makes the lens not a strong performer for low light tasks, but it still manages to offer optical image stabilization, which helps. The most significant advantages, however, are its absolutely tiny size as well as its significantly lower price point of just around $300. Although not significantly different than the older model (seems like Panasonic took a bit of a "if it ain't broke, don't fix it" mindset here), the 12-35mm f/2.8 II is a reliable, high quality, classic zoom lens for really any Micro Four Thirds owner, not just Panasonic owners. The styling has been updated and modernized, and a few areas worth improving have been updated, primarily adding Dual I.S. and Dual I.S. 2 compatibility. Overall, Panasonic's versatile 24-70mm-eq f/2.8 zoom remains small, light and ruggedly built while still offering excellent image quality and great AF performance. At around $900, much like Olympus' 12-40mm f/2.8 Pro, it's not a cheap lens by any means, but it packs the features and performance that advanced photographers and videographers demand. If you need a single, solid lens that's ideal for landscapes, travel, street photographer, portraiture and more, the Panasonic 12-35mm f/2.8 II is an excellent choice. It's compact and lightweight, it has good image quality, excellent stabilization and it looks good too. What more can you ask for in a standard zoom lens? I love this little lens. I prefer it over the Olympus 12-40mm because it's more compact and I like the overall design better. Are prime lenses superior? Yes, they often are, but this is a zoom.